AR-15 Stocks: What Do I Have-What Should I Get? A common theme in our blog posts is to concentrate on the application in which you plan to use your AR most of the time when deciding on its configuration. An easy way to upgrade a basic AR-15 is to select a stock that will enhance the weapon’s usability and performance. In this post, we will explain the basic differences in AR-15 stocks in order to help AR enthusiasts select the best stock for their application. Most AR-15 rifles come with either a fixed, A2 style stock or a collapsible, multi-position, M4 style stock. 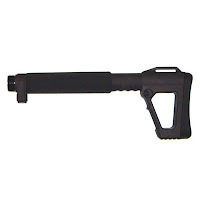 The stock is mounted on the buffer tube that attaches to the lower receiver. Fixed and collapsible stocks use different buffer tubes, and there are two main types of collapsible stock buffer tubes: mil-spec and commercial. Some fixed and collapsible stocks also use their own proprietary buffer tubes (Magpul UBR, Ergo F93, and some Ace stocks). We often receive inquiries as to which of the two types of collapsible stocks/buffer tubes would offer the best performance. Before there were a zillion producers and marketers of AR-15 accessories, many aftermarket stocks were only made to fit the mil spec buffer tube. This situation either limited the choices for AR owners who had a rifle with a commercial size tube, or forced them to purchase a new mil-spec buffer tube and deal with removal of the old parts and installation of the new ones. 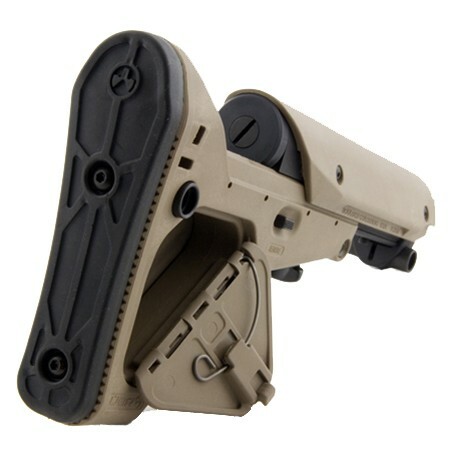 Most AR parts manufacturers now offer all models of stocks in their product line in both sizes. Mil-spec buffer tubes have an outside diameter of about 1.15", while commerical tubes have an outside diameter of about 1.17". Mil-spec tubes are minimally shorter, measuring 7.25" in length, while the commercial tubes (with the slanted back) are about 7.80" in length. Whether or not there is a quality or performance difference between the mil-spec and commercial models of stock/buffer tubes is a matter of opinion. Some people believe that the manufacturing processes and materials used make one better than the other; but honestly, you have to be doing something outside of the weapon’s design to have this part of the AR-15 fail or contribute to a problem. The image we have displayed shows the actual measurements of the two buffer tubes. While there is a minimal size difference at the thread area of the tube, both tubes will fit securely on any mil-spec lower receiver. One way to tell if you have a commercial or mil-spec buffer tube on your weapon is to remove the stock from the buffer tube. 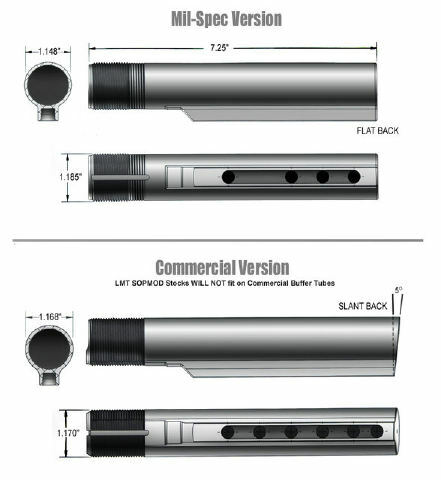 Typically, a mil-spec buffer tube has a flat end, while the commercial tube has a slanted end. If you can tell which type is currently on your weapon, you can save some money by only having to purchase the correct stock, instead of a stock and compatible buffer tube. Removing and installing a stock is a very simple process; removing and reinstalling a buffer tube, end plate and castle nut can require a little more skill and is much easier with some specific tools. The main benefit of collapsible stocks is their ability to shorten the “length of pull”. This can allow users of various sizes to comfortably shoot the weapon. Collapsible stocks also provide reduced overall length for storage, transport, and close quarter engagement applications. Some AR users prefer fixed stocks because they offer a quick and repeatable “cheek weld” for faster sight/target acquisition. Stocks like the Magpul UBR and Ergo F93 have a fixed cheek position, but still collapse and extend for length adjustments--offering “the best of both worlds”. It is important to note that some states and local municipalities prohibit collapsible stocks. Your state's DOJ website should have this information available. If you have any questions about stocks, selecting the right one, or anything related to the AR-15, please contact us. Our sales/customer service team would be happy to assist you in choosing the right one to enhance the performance of your AR-15. AR-15 Slings...Which Style Is Best For Me? If you spend any time carrying or holding your weapon, it won’t be long until you decide that a sling is a must have item for your AR-15. In this post, we will discuss the different types of slings and the various ways to attach them to your rifle. Single point slings are designed to be worn over your support hand shoulder, and they hold the weapon in a muzzle down position. They are very quick to move into a firing position, but because they only attach in one place on the weapon, the weapon can tend to move around quite a bit when you are moving. This almost necessitates placing a hand on the weapon to brace it when you move. On an AR-15, these are typically attached to the weapon with a single point sling adapter that replaces the receiver end plate or at an attachment point on the stock or lower receiver. Two point slings typically attach near the stock and at a point near the end of the handguards. Some manufacturers make slings that can be converted from single point to two point as application requires. The Magpul MS2 sling is of this design. 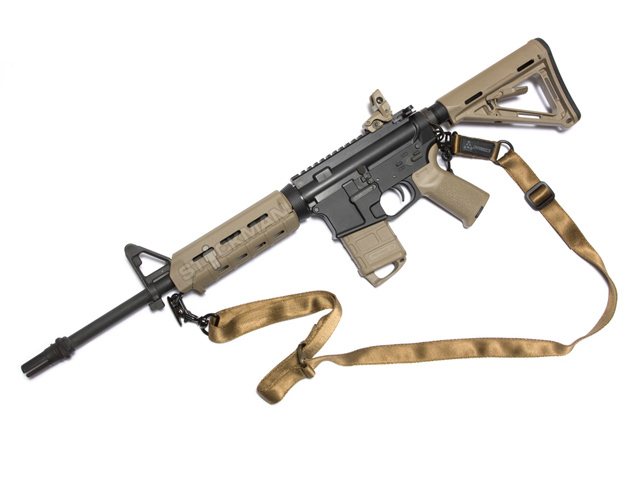 The newer MS3 sling has the same benefits with an improved and more comfortable web material and width. Two point slings offer a much more secure "carry" when you are required to move. Magpul also makes a rail mount sling attachment for this style of sling to attach to a rail section at the forward attachment point. Older, “standard” two point slings are typically designed to be carried around a shoulder with the muzzle up and the weapon behind the shoulder/arm. These attach to the sling swivels on the stock and under the front sight base. 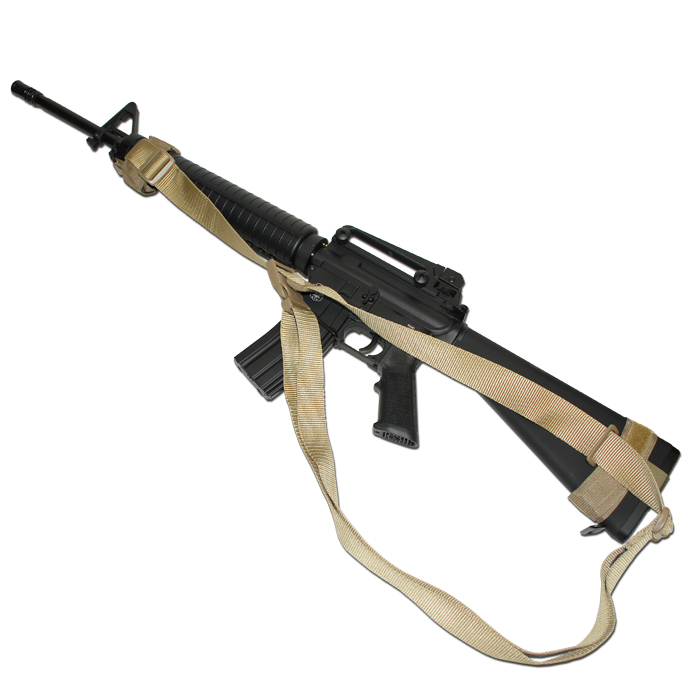 More modern two point slings are designed for muzzle down carry and are also very “quick to shoulder”. Three point slings attach at two points on the weapon, but also have an additional strap the runs between the two attachment points. These are very secure when movement is required and are designed for muzzle down carry. Some AR-15 owners do not like this style because the strap running between the attachment points can cover the bolt catch, but this is a matter of personal preference more than anything...the bolt catch is still easy to manipulate with this style. Three point slings often have nylon webbing with a greater width that can provide more comfort if the weapon is carried for a longer period of time. 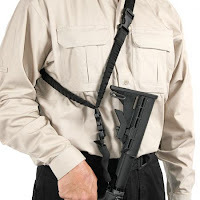 Most modern slings in all three styles come with a quick release feature should the need arise to have the weapon completely unencumbered by the sling. Because sling choice can be a matter of personal preference and to prevent you from owning several before you find the one that serves your application, it’s a good idea to ask other AR owners what works for them and why. Researching opinions on the internet or reading reviews on retailer websites can help you focus in on the design that will help you enjoy your AR-15 even more. Thanks for reading our blog; if you have any questions about slings or anything related to the AR-15, please contact us!